Day 8 - We were woken by the 'Call to Prayer' this morning. After being in the Toubkal refuge the last few days, you start to forget about it but back in Aremd it's quite noticeable. My first thoughts of it is it's quite relaxing but when it goes off at 5am and is the longest call of the day (nearly half hour this morning) it can be quite annoying. But that's one of the reasons I wanted to come to Morocco in the first place to experience new cultures and all that and like I said I find it quite relaxing. We are told to meet are Muleteer at 10 who is going to take all our bags down to the taxi, where he will be picking us up at 11 to take us back to Marrakech. The Mules are great and well worth the 150 dirham (just over £10) if you have heavy bags, today though he wasn't happy at all and being quite a naughty Mule, you could tell the Muleteer was getting quite annoyed with him the little bugger! Our taxi driver took us into Marrakech as close to our Riad as possible, some Riads are very difficult to find and our one was one of those, we eventually found with the help of a very friendly Moroccan man and we sat down inside drinking some nice Mint Tea. We sat there for about 45mins and we were both getting itchy feet as we just wanted to go and explore Marrakech and get some more Dirham out. At first the guy thought we were here for a massage! Even though I showed him our reservation. In the end the owner came and greeted us and they had made quite a big mistake and there was no room for us in the Riad. He got in contact with another Riad just round the corner and they escorted us over and even carried our bags for us. This Riad seemed a lot posher than our previous one and we were still only getting charged the same so for us was a win win situation. The Riad was situated right on the outskirts of the Souks, which are some very narrow streets and alleys just crammed with people and stuff to sell, even the motorbikes use these streets so it's very easy to get run over! Touch wood this hasn't happened yet! It's so easy to get lost in these souks and we found out later that evening when we thought we were going the right way when we got told by a kid no older than 15 that we were going the wrong way. Now everyone has told me not to listen to the kids or anyone when it comes to directions as they will just scam you for money. For some stupid reason I listened to him this time and he lead us on this mystery tour and then demanded money. I was quite harsh and stubborn on this situation and I didn't pay him, which led to him saying some stuff in Arabic but I don't know what he said so I don't care! I would of probably of paid him had he not took us to the exact spot we had started from and then pointed in the way we were going on the first place. Moroccan kid 0 - 1 Adam. 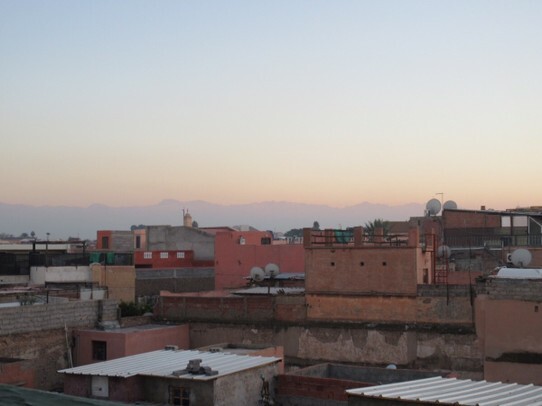 In the morning we head to the bus station to catch a bus over to Essaouria. We didn't take many photos either of today as we were quite busy and we are back in Marrakech for the remainder of our trip once back from Essaouria.